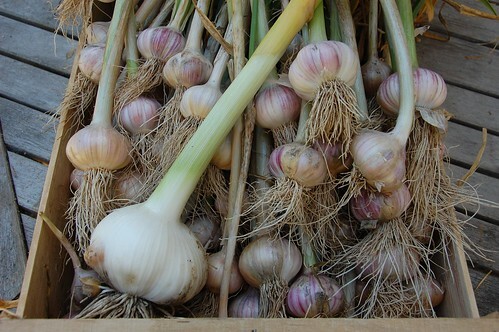 Today I harvested the hard neck garlic. It might have benefited from another 10 days in the ground but I've found that if it gets wet after starting to go dormant it becomes difficult to clean and shatters easily. This is proof, if it were needed, that this variety was selected in another part of the world to this country. Ability to stand in indifferent weather is an eagerly sought characteristic in Northern Europe. I also took one of the elephant garlics. You can see in the picture that not only is this as huge as you might expect but there are small offsets which form between the layers of the bulb attached to rootlets. A useful way of multiplying up the stocks for next year's planting although they will take a couple of years to reach full size. I wasn't expecting them to have flower heads but when they started to show it was intriguing enough to leave them. I wondered if they would also make bulbils on the heads like the the Babington leeks, but they didn't and I'll just nip them off next year. And the Babington leeks don't seem to have liked this hot dry weather at all, they have died right back and a bit of excavation failed to find bulbs at any depth. I'm hoping they'll renew themselves come the autumn but in the meantime I'll have to mark the row carefully so that they don't get turned over by accident. Still one more garlic crop to come; the Arno garlic, still growing strongly and miraculously free from rust. I think that will probably be another month finishing. Be sure to check out this guy. He is true garlic fan! P.S. Sorry for the double post.